Durability is the measure of how many "uses" something has. Currently, this extends to houses﻿, stables﻿, pots﻿, and legacy equipment. 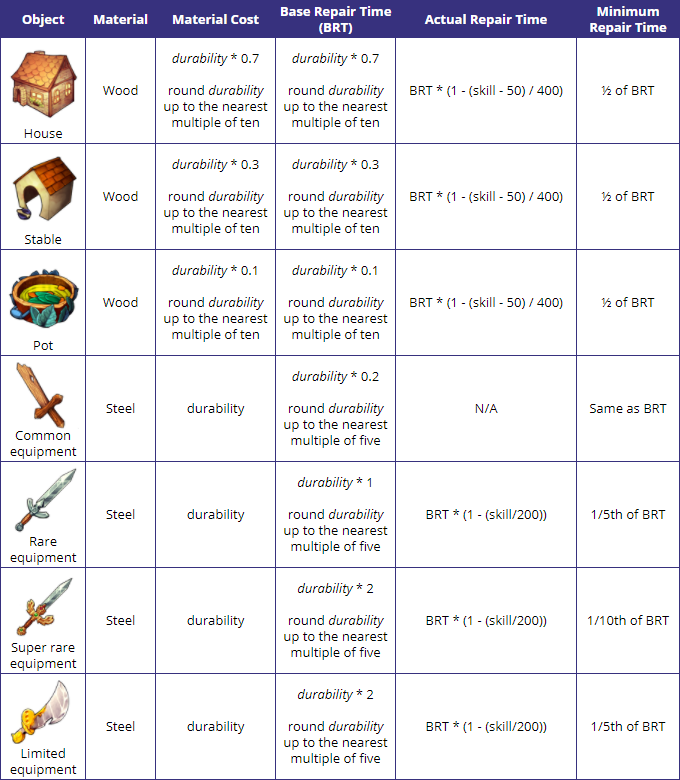 The maximum durability of these items depends on the skill level of the villager who built them. 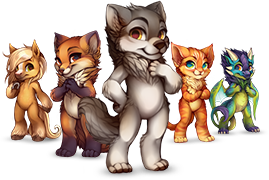 When these objects are equipped, they will disappear from the inventory until they've been unequipped. A single "use" varies depending on the item. House durability falls one point every day the house is occupied by an active worker. Stable durability falls one point daily when equipped to a villager. This happens shortly after rollover at midnight. Pot durability falls with every harvest. Legacy equipment cannot be used - its durability cannot fall. The item names change color when durability falls. Normally blue, it turns green at 75% of the max, yellow at 50%, orange at 25%, and red at 0%. This is a graduated change, not an abrupt one. Please note these colors are only visible on career pages, in the inventory, and in stalls. Should an item reach zero durability, it will break. There is no way to repair an item at zero durability since it has been effectively destroyed. Plants and animals in broken pots or stables will disappear, and villagers in broken houses cannot work. Since the Serpent's Festival of 2018, houses no longer break and will instead stay at 1 durability, so you need not worry about that unless you have a house that broke before February 2018. However, items between zero and maximum durability can be repaired, by either by others or yourself. To have someone else repair your objects, visit the maintenance market or the villager's career page﻿. The market only shows residents of your village. At the market, a ☹ after the villager name denotes minor sickness and doubled repair times. The Repair Structure button allows you to select occupied houses and stables or pots currently equipped to your active. The Repair Item button allows you to select those that are those currently in your inventory. If the user is not available to complete a repair, you can do so yourself﻿. Other users whose active villagers are construction workers can also offer to repair your structures for free, no cost to you at all. You will need to accept their offer for them to begin working. To repair your structures yourself, set a construction worker as your active villager. Visit the profile or career page of the villager with the structure equipped, and there should be a Repair button. If you want to repair items, visit the career page of your construction worker or blacksmith and Begin Repairs. Repairs cost both materials and time. Calculations to find both are detailed in the following table. Any references to durability as a variable refer to the difference between an item's max durability and its current durability. Repair times are reduced depending on the skill of the construction worker or blacksmith. This does not take into account any costume buffs. Each item has a minimum repair time. Maximum durability can be increased with potions and fairies. House Durability Potions only work on houses. Item Durability Potions apply to stables, pots, and legacy equipment. Snow Festival Gingerbread Fairies﻿ work on structures, and Snow Festival Bell Fairies﻿ work on legacy equipment. To apply these, click on them from the inventory. There will be an option to the potion. The absolute maximum durability of an object is 2^32-1 or 4,294,967,295. Potions and fairies will have no effect after this. of a house by 10.
of an item by 5.
of a structure by 10%. of legacy equipment by 10%. On May 6th, 2017, the combat system was updated and revamped, removing durability from equipment. Legacy equipment from the old system can be converted, and high levels of durability are rewarded as follows. Items with 3x base durability will have one socket slot. Items with 10x base durability will have two socket slots. Items with 50x base durability will have 130% potency and all of the above. Items with 1000x base durability will award the user with the Durability Star trophy and all of the above. ﻿This trophy can be awarded multiple times. Base durability is the maximum durability possible on an item without using consumables. This information is detailed in the table at the end of this guide. Not all equipment can have sockets. Before committing potions or fairies, make sure to check the Item Museum﻿. For example, the Fang Spear page does not describe how many sockets it can have - this means converting a 10x Fang Spear won't do anything. 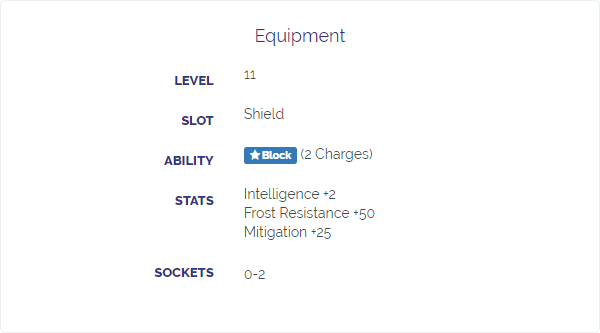 The Frozen Bone Shield page shows it can have zero to two sockets - this means converting a 10x Frozen Bone Shield will guarantee you two sockets on the item. Legacy limited equipment will have a minimum of 130% potency when converted. If it has over 50x base durability when converted, it will have 135% potency. Depending on rounding, the Durability Star trophies requires roughly 72 to 73 bell fairies on an item at base durability.